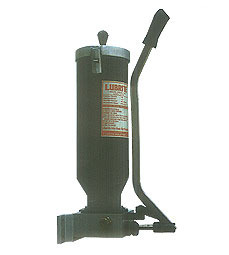 Lubrite Industries is an ISO Certified Manufacturer and Exporter of Manual Grease Pumps. 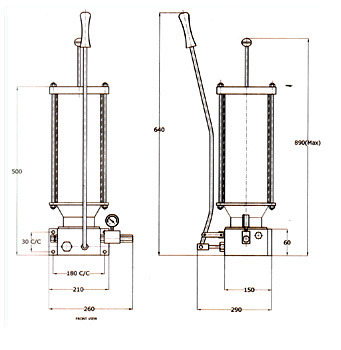 We manufacture Complete Centralised Lubrication Systems. These are heavy-duty Grease Pumps and are used where the total no. of points are more than 20 or the lubrication lines are lengthy. To avoid the extra load on operator, the handle of the Pump is extra long and is equipped with Lever system. When the handle is pushed, grease is sucked from the reservoir and is ejected under pressure by pulling the handle out. These Pump are wall mounted and should be installed vertically at a place conveniently accessible to the operator. In case of Plant Lubrication with various machines, the distributors or Progressive Blocks are mounted on each machine and the pump is mounted on the trolley to lubricate the plant with the help of Flexible Hose Pipe and Quick Release Coupling. Maximum Pressure 120 kg/ sq.cm.